I was suffering the ravages of one too many Blondes (see previous episode). Fortunately, I had several hours and a Drover’s breakfast to throw up before my pre-arranged meeting with fellow-rider Ian and his entourage at Arrochar on Loch Long. 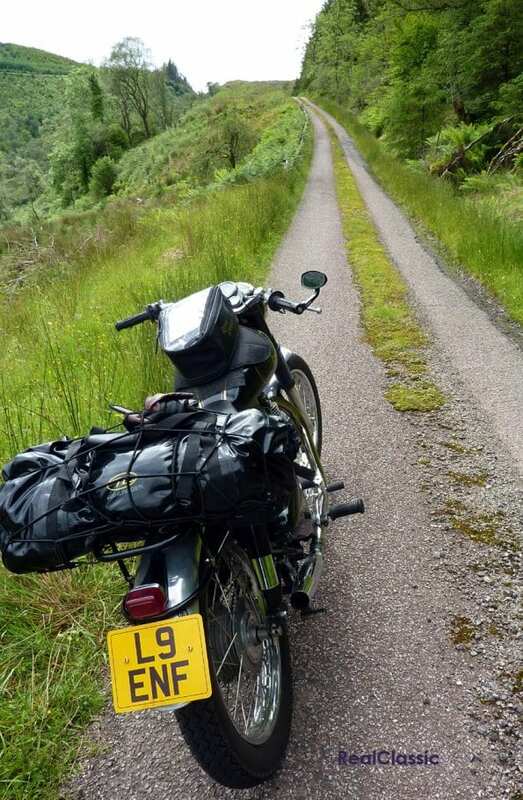 The ten mile, wet ride down Loch Lomond was crammed with tour busses and caravan cavalcades and reminded me of why I’d left for a dry and quiet life in the east many moons ago. My immediate mission was to find a lochside lay-by to bag a scenic picture of Loch Lomond, but none were forthcoming and my turn-off for Arrochar was looming. So I made a U-turn back up the road to a watersports centre and pointed my Lumix at the loch. The loch didn’t smile. Minutes later as I was watching Tarbet shrinking in my rear view mirror, signs for Arrochar reared up. I hadn’t remembered the road very well, but around a long bend lay Loch Long, our pre-arranged car park rendezvous, and a petrol station. I fuelled up then walked the Enfield across the road to await Ian and his party. The car park offered stunning views over Loch Long – this I did remember! A cluster of even more dramatic information boards told the harrowing story of Viking raids throughout the area and I was immediately reminded of the Glasgow hen party I’d encountered the previous evening. The familiar sound of thunder broke my stupor and Ian rolled up on his lean-burn Enfield single to announce that our companions Doug and his son would be delayed by several hours. Our reunion was now moved to Doug’s house in Macrihanish. ‘Best laid plans an’ aw that’, once penned a Scottish Bard. No? 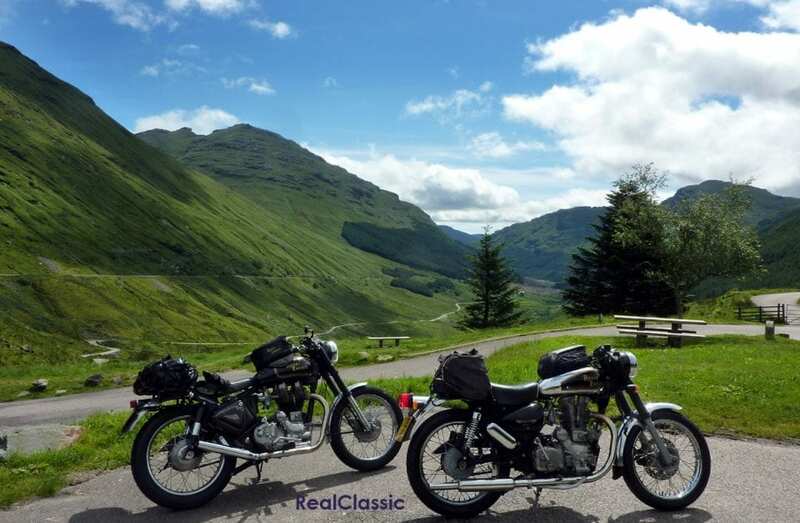 We fired up the Enfields and hammered around Loch Long to reach the highlight of the trip for me – the A83’s ‘Rest And Be Thankful’ that climbs steadily up one of Argyll’s fairy tale mountains, the Cobbler. The road was much improved since my last scramble on a Commando up its sheep-infested and boulder-strewn slopes. The welcome ‘Rest’ is perched on top of this dramatic climb and is a visitors’ car park with a burger van but no toilets… an oversight which does not make the traveller feel particularly thankful. The views, however, are worth holding your waters in for. But after swilling just one coffee I was soon searching for an outdoor latrine, whereupon I stumbled across a secluded shrine to past R&BT thrill-seeking fans. Everywhere were commemorative plaques, nailed to the rocks in memory of long-departed hill walkers who had once enjoyed this famous vista; several plaques went back twenty years or more. I was moved and beat a respectful retreat. 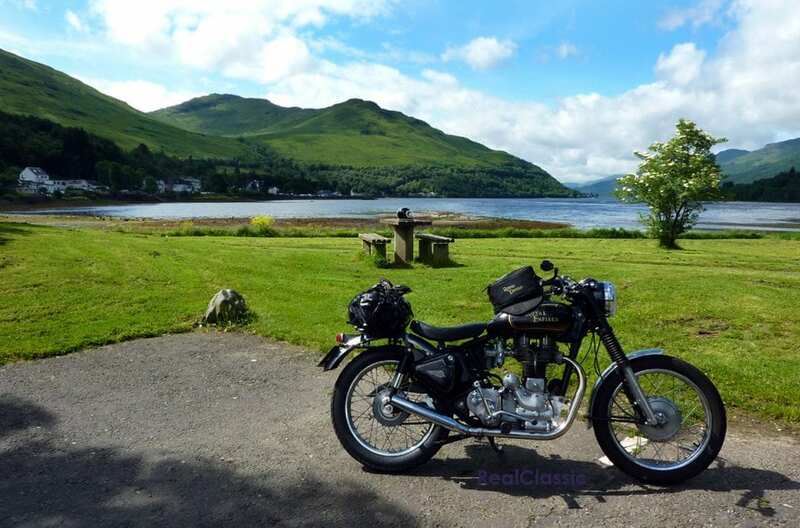 The busy A83 continued to deliver spectacular scenery, but when we turned onto the A815 south road along Loch Fyne the traffic began to thin, until we were all alone in a vista of gently rolling hills and sandy beaches. The views across the loch to Inveraray were all new to me as, until today, I had always travelled the main A83 through Inveraray, Tarbet and Lochgilphead. 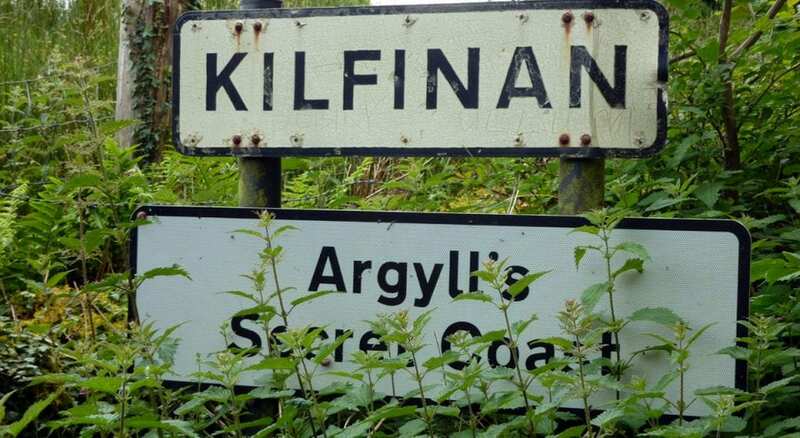 Instead, this route would take us to Portavadie via the A886 where we planned to catch the 20 minute ferry crossing over the Sound of Bute to Tarbet. 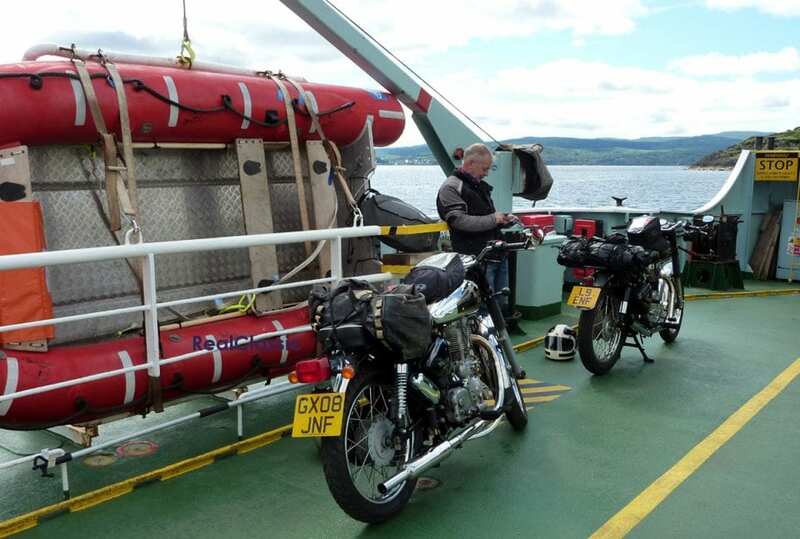 As we travelled further south, the road became a fairly uninspiring ride, until we took a detour onto the B8001 to Otter Ferry. This turned out to be a single track road with a well-established verge growing up the middle, suggesting the route saw little, if any traffic. But just as I stopped for a photo, didn’t a car pull up behind me! 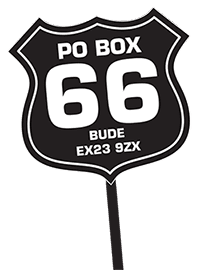 The B8000’s bends were of the jack-knife variety and would be a challenge to any large multi-cylinder motorcycle, never mind a car. I was thankful we were on featherlight and flickable singles – perfect for this pioneering terrain. 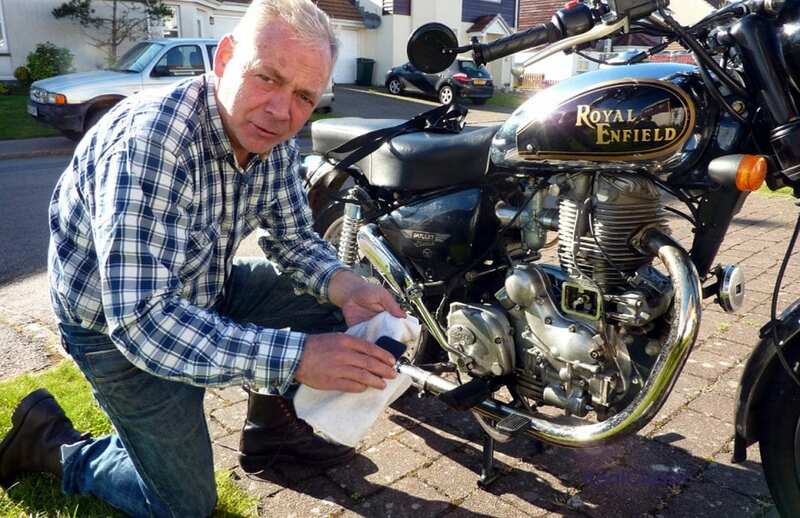 During one of our rests, Ian noticed that his Enfield had developed a prolific oil leak from the barrel’s tappet cover, so we decided on a short detour to Tignabruaich to find some gasket cement and stem the flow. Unfortunately the shops were all closed, as was the renowned seafood restaurant ‘Botanica’ that we had fancied for a lunch stop. 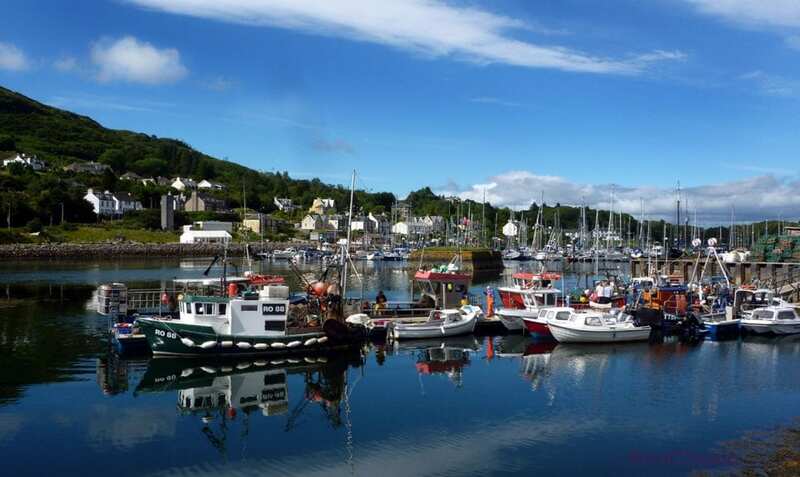 So with our plan in tatters, tums still rumbling and bleeding oil, we instead diverted to the new harbour development intended for ‘yachties’ at Portavadie, to indulge in what can only be described as ludicrously expensive titbits before boarding the mid-afternoon ferry to Tarbet. Despite the smouldering heat, the short ferry crossing to Tarbet was also a refreshing experience. Out in the Sound of Bute a cooling sea breeze ruffled up white horses. On the ferry’s western side lay the unmistakable and rugged silhouette of the Isle of Arran and, at the bow, the shimmering sight of Tarbet began to fill our horizon as an excited gang of squawking gulls guided us into port. We disembarked and pulled up at a quayside cafe to tuck into some scrumptious coffee and cakes. Then a recharged Ian marched off to find some gasket cement, while I went to take a few digi-snaps of Tarbet’s harbour in the splendid weather. On returning to the cafe, I was press-ganged into taking pictures of an excited and bowing Chinese tourist who thrust his camera at my chest and posed his grinning self in front of my Enfield – his intentions were obvious in any language. As I clicked away, my new found friend cackled continuously in Chinese while I replied in broad Scot, to the extent that it might seem to curious bystanders that we were embroiled in an engaging conversation. But gesticulation won the day and after several clicks he bowed for the final time, then headed towards some quayside fishing boats. Ian returned with some gasket cement, gave an enthusiastic thumbs-up and we immediately kitted-up for the final leg to Machrihanish. 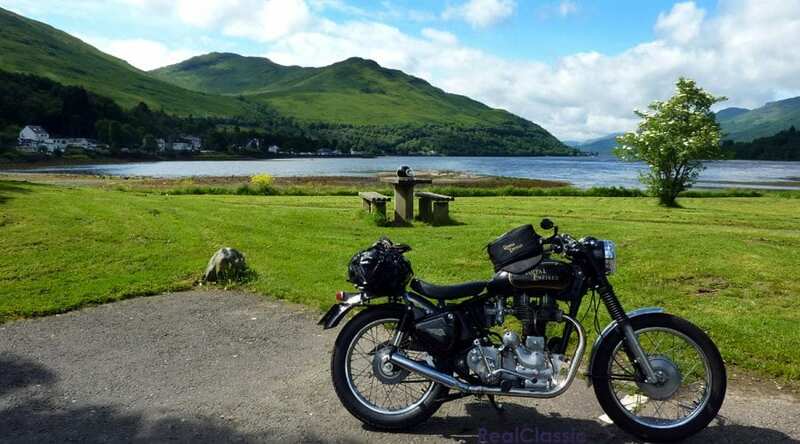 The emerald green ocean and island views made our spirits soar that afternoon, and the occasional spurt down West Loch Tarbet’s isolated road added to an epic ride. Gigha, Islay and Jura lay off to the west and only a long stop, to allow meandering cows across the road, hampered our progress. We had no sooner arrived at Doug’s house and attended to Ian’s leaking Enfield, when Doug and his young son Gregor arrived. Doug had borrowed Ian’s Hinckley Bonneville for the trip and his son Gregor was riding a newly-acquired Suzuki DR125 – CBT tucked safely under his belt only days before. I was impressed that our young apprentice had made it this far, as the bleached bones of Bantams and BSA C15s of my youth lay rusting and scattered up and down the perilous slopes of the Rest And Be Thankful. Perhaps I should return and mark where they fell with commemorative plaques? We laughed at this absurdity over a whopping curry and several King Cobras at Campbeltown’s best Indian. Then we returned by taxi to raid Doug’s bar – it was a splendid evening in jovial company.